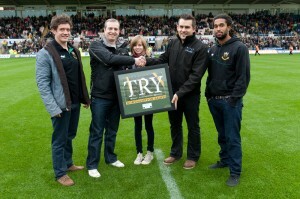 We were delighted to present our first signed Try Card at the Saints on Saturday to Ben Spragg. The card was signed by a number of the Saints players and presented by Adam Kirby from Mirus. We’ll be giving a signed card at each of the home games this season so please register to win on the following web site www.mirus-it.co.uk/trycard. All entries are selected at random the week before each home game.